Keep your home smelling fresh and clean with True HEPA and Carbon Replacement Filters! Air never felt so pure with Advanced Filters. Pet owners, smokers, people suffering from asthma or allergies trust VEVA Advanced Filters for their needs, whether to remove odors, smells, allergens, pet hair, dust or smoke from their household. ► UPGRADE YOUR AIR PURIFIER - We use the highest quality materials to help you get the most out of your air purifier. The True HEPA filter and Pre-filters are made thicker and more absorbent. Working in combination to improve the overall indoor air quality of your home. ► EASY INSTALLATION - These are perfectly cut and specially designed to fit Air Purifier Models AC4300BPTCA, AC4900CA, AC4825, AC4850PT, AP2200CA and BXAP148. 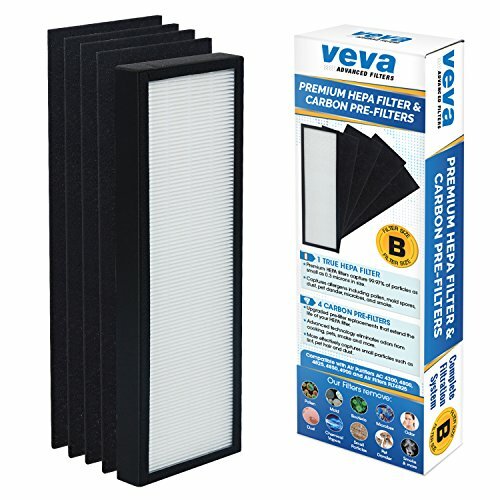 HEPA Filter Dimensions: H: 15.75" x L: 4.72" x W 1.1" and Pre Filter Dimensions: H: 15.75" x L: 4.72" x W 0.2"
► SUPERIOR VALUE - Get more for your money and save with VEVA Advanced Filters: With each HEPA filter in each pack you'll 4 additional pre-filters to soak up those nasty odors, smell and smoke. Each pre-filter will boost the life of the your HEPA filter, so you get more. Click ADD TO CART NOW and receive VEVA Advanced Filters 100% Money-Back Guarantee on a 90 day no-questions-asked refund policy. This is a generic product designed and engineered in the United States by Advanced Filters. We are not affiliated with, sponsored by or associated with Germ Guardian®. Use of GermGuardian®, PureGuardian® or Black+Decker® brand names and logos are the registered trademark of their respective owners, and this OEM product is not covered by their warranty. The GermGuardian®, PureGuardian® or Black+Decker® brand name, model number or model designation for this product is made solely for purposes of demonstrating compatibility. PREMIUM QUALITY - True HEPA filters capture 99.97% off of dust and allergens as tiny as .3 microns to remove things like household dust, pet dander, mold spores, and pollens. Ideal for anyone who suffers from allergies or asthma. UNBEATABLE VALUE - You'll get one HEPA Filter along with 4 extra Activated Carbon Pre-Filters. Cheap enough so you can simply remove and replace each pre-filter after use to eliminate the hassle of cleaning or vacuuming. The pre-filters extend the life of the main HEPA filter and can be used up 6-8 months depending on use. FITS PERFECTLY - Compatible with Air Purifier Models AC4300BPTCA, AC4900CA, AC4825, AC4850PT, FLT4825 Filter B, AP2200CA and BXAP148. We include step-by-step instructions for quick and easy installation every time. HEPA Filter Dimensions: H: 15.75" x L: 4.72" x W 1.1" and Pre Filter Dimensions: H: 15.75" x L: 4.72" x W 0.2". SAY GOODBYE TO ODOR - Activated Charcoal filters helps reduce common odors from pets, smoking and cooking. This value pack will last for the whole year to maximize your air purifier in your home. No more nasty smells in the house to improve the indoor air quality. If you have any questions about this product by VEVA, contact us by completing and submitting the form below. If you are looking for a specif part number, please include it with your message.